Happy Thursday everyone! I can’t believe we are on the second last page of Mission 003! It is very surreal for me as Mission 003 was drawn back in 2010 so it has been a long time getting this issue out to all you amazing people. Up until late last year these first 3 Missions were all I had of Team Stryker and it felt like they might be only Missions as I wasn’t sure where to go with them. After spending so much time drawing, inking and coloring Mission 003 it is bittersweet for me to have this issue wrapped up. Before I started drawing Mission 004 this issue was my greatest accomplishment in the world of Team Stryker. Where Mission 001 and 002 were done more as experiments, Mission 003 was done with the intent of it being a professional grade comic. It was done on 11×17 inch comic board and I used all the skills and techniques I learned doing 001 and 002 to make sure that this was the best comic I could do at the time. While there are many things I will always want to change I’m very proud of way this comic has turned out and I am very grateful for all the praise and support I’ve received over since I began posting it back in October of last year. I’m now working harder than ever to make sure that when Mission 004 debuts next month that it raises the bar for 005 the way 003 has raised the bar for 004. Thank you all for your continued support. 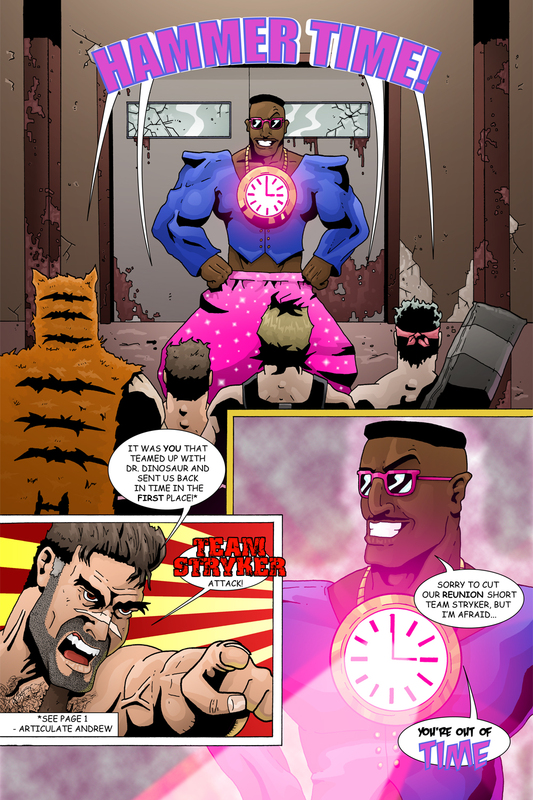 There is still time to get your Team Stryker fan art in! In between Mission 003 and 004 I’m going to take a couple weeks off and post some amazing fan art I’ve received from some very talented people. If you would like to see your artwork on Team Stryker email me at andrew@teamstrykercomic.com with your picture and a small write up about yourself. Have a great weekend and I will see you back here on Monday for the final page of Mission 003!